Maltaward Civil Engineering Contractors offer professional security services in Nottingham and across the South East of England, drawing from over 35 years’ experience to ensure that each and every client receives a highly competitive service. Contact our expert team on 0800 043 2742 for professional assistance on the recommended type of security barrier for your needs. High quality security is essential for clients working on construction sites, to protect vacant properties and for security events and commercial security events. It is important that clients are able to rely on a swift and professional service provided by experts. 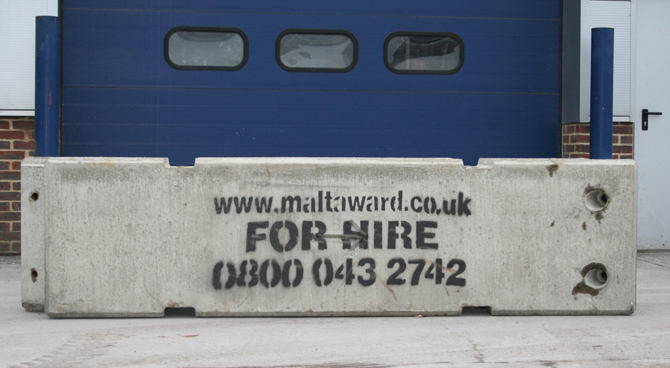 Maltaward offer concrete barriers for sale and for hire, depending on individual client requirements. With both concrete and plastic barriers available in addition to security fencing, marquee blocks and kentledge blocks among a number of other products and services, the professional team at Maltaward can help whatever your needs. As security contractors working from our Nottingham Depot, Maltaward’s dedicated team of qualified staff are ready to help. Where line painting and road markings are concerned, Maltaward offer a swift and effective service. We organise your line painting and road marking as quickly as possible to ensure minimal downtime, leaving clear and visible markings for parking bays, double yellow lines and more. Maltaward is proud to be working as Airside delivery & collection approved contractors for both Gatwick and Heathrow Airport. We are also a CHAS accredited company, confirming the practical level of service we provide to all clients. All equipment provided has been tested to the latest health and safety regulations in order to ensure that it remains in full working condition. For expert advice and assistance on the hire of concrete blocks from our Nottingham Depot, among a wide range of other security and civil engineering services, get in touch with our professional team today.